Oʻahu is about 382,500-acres in size; the district of Puna on the island of Hawaiʻi is about 320,000-acres in size – almost same-same. For some, it sounds like optimal living; and, many are moving to the Big Island to enjoy this rural lifestyle. Open spaces with room to roam, it sounds kind of like the Wild West. And, for some, that’s its nickname, however, not with the same context. Between 1958 and 1973, more than 52,500-individual lots were created. There are at least over 40 Puna subdivisions. Geographically, these subdivisions are sometimes as big as cities. For example, Hawaiian Paradise Park has over 8,800 building lots and is reportedly the second largest private subdivision in the United States. It is over 4-miles long and nearly 3½-miles wide. Most lots rely on individual catchment systems (captured off the roof and rainfall stored in water tanks) supplemented with private delivery trucks for drinking water. None of the subdivisions have central sewer systems. Large sections of some subdivisions are off the power grid. Oh, and one more thing, about 6,400 subdivision lots lie in the highest lava hazard zone and over 500 of these are exposed to additional risks from subsidence, tsunami and earthquakes. That’s not just hazards noted on a map; nearly 2,500 of these lots have been covered by lava flows or have been rendered unbuildable by shoreline subsidence over the years. While most of these subdivisions are on agricultural-zoned lands, the actual use of developed lots is predominantly residential. At the time these subdivisions were approved, the Puna district was sparsely populated and, with the exception of a sugar plantation and a small-scale visitor attraction at the volcano, which had not yet been developed as a national park, there was little economic activity in the area. Shortly after the approval of the first of these subdivisions, Hawai‘i was admitted as the 50th state. That event, coinciding with jet travel, spurred increased investment in the Islands. To prevent the excesses of land speculation, Hawai‘i adopted the first State Land Use Law in the nation in 1961. Most of the Puna district was placed in either the Conservation District or the Agriculture District when formal boundaries were established in 1964, and this somewhat served to abate the number of subdivision applications. However, it wasn’t until the County adopted a subdivision ordinance in 1973, setting more rigorous lot size and infrastructure standards, that large subdivisions with minimal services were effectively discouraged. In the first decade or so following the creation of the non-conforming subdivisions, lot sales were fairly brisk, but there was little lot development. In the 1970 Census, the recorded population of the Puna District was only 5,154-residents, most of whom lived in the older settlements of Kea‘au, Pāhoa and Volcano. That was then, over the years the population exploded, doubling to 11,751 in 1980, then up another 10,000 by 1990 (to 20,781,) and another 11,000 by 2000 (to 31,335,) to the 2010 population of 45,500. Population growth has worn on the minimal infrastructure, as well as people’s patience. Today, folks in Puna are living with the lack of planning and regulatory control over the subdivision bonanza days. But, they do benefit from lower sales prices (associated with the general lack of facilities and the huge availability.) Some say you are getting what you pay for. This region is finally undergoing some short and long-range planning. The Puna Community Development Plan has been adopted (and has already had several amendments.) Much of the information here comes from the Puna CDP documents. Depending on your perspective, addressing the issues in this region today is either a planner’s nightmare or a planner’s dream. This is an area where I would love to get involved – for me, challenges create opportunities. 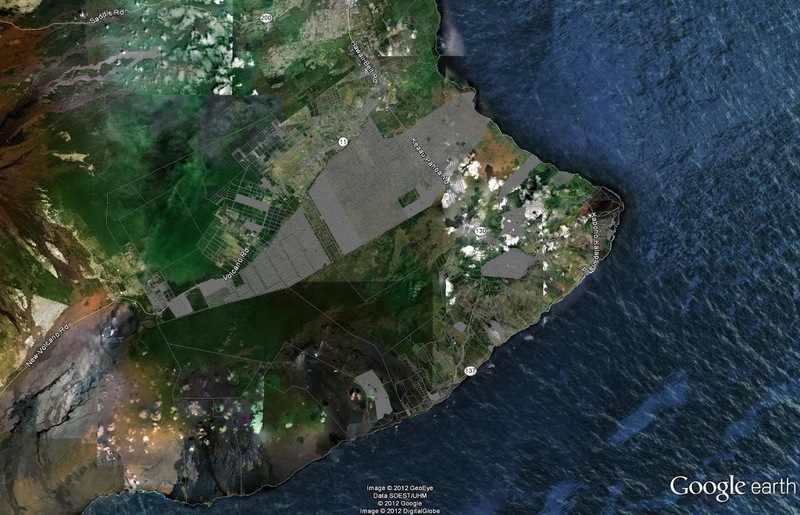 The image notes the individual parcels within the Puna district (overlaying the Google Earth image.) At this scale, many of the lots are not discernible – the fully gray areas indicate smaller lot residential uses, with no (or very limited) park space – where you can just see between the lines, these are 1-5 acre parcels. I have added some other related images in a folder of like name in the Photos section on my Facebook page.